How often should my tank be drained? 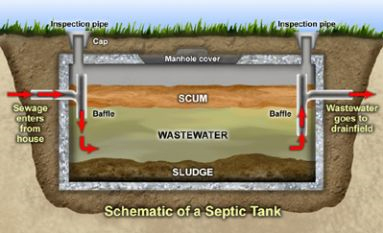 To ensure a functional septic tank, the accumulated sludge must be removed every 4 years. Failure to do so can lead to expensive and unpleasant issues. Household pipes could become backlogged with sewerage. Preventing toilets from flushing properly and in critical situations, having the sewerage come back up through the pipes. Manage the volume of water entering the system. Excess water can hinder the operation of your septic tank. There are some simple measures that can be taken to improve the operation of the soakage trench. Leaking taps and toilet cisterns should be repaired, otherwise water is being wasted. Downpipes from the roof should be diverted away from the septic tank because rain water should not enter the wastewater disposal system. To be very proactive about water control, operate the dishwasher and washing machines at separate times and don’t do numerous large (water level wise) washing loads in a small-time frame. This will spread out the amount greywater entering the system. Nothing should be constructed over the septic tank or soakage system; this includes no driveways, pavements or buildings. If construction has effected how rain/storm water causes through your yard/property, the soakage system needs to be considered. All stormwater should be diverted around the soakage area, this can be done by installing a stormwater diversion trench. Do not allow traffic to affect the tank or disposal area. This means vehicles should not drive over any part of the system as it can cause costly damage. What should NOT be ‘flushed’? Here is a simple list of items/liquids/products that should be kept clear of your wastewater system as they have proved to negatively affect the system, the pipes, the environment (pollute groundwater) or a mixture of all three! Strong chemicals including: pesticides, paint, solvents, thinners etc. ‘Flushable wipes’ (of any kind) are not flushable! Just put them in the bin instead. Despite claims by big brands recently, wipes do not disintegrate like toilet paper. Save yourself an expensive plumber job and don’t flush any wipes. Note: If you have a sand filter or an Aerated Wastewater Treatment System (AWTS) please read, understand and follow the manufacturer instructions, as they can differ from standard septic tanks. The materials mentioned above will still not be flushable for AWTS, however, there are often additional products that can’t be flushed. You can contact us if you are unsure, or need help understanding the instructions, we will be happy to help. For any information regarding the care of your wastewater system, please contact us on 08 8260 7660.